Easily mistaken for a Boggy Bayou at first glance, this vase was created from the same mould used for the bowl that was named Cut Arcs by Hartung and Reverse Drapery by Heacock. 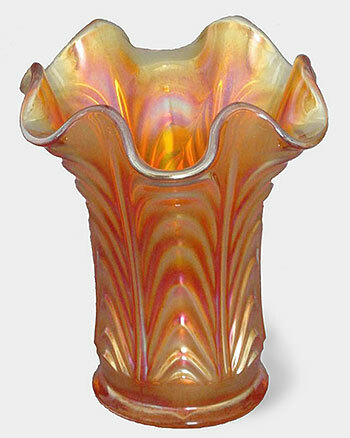 There are opalescent, non-iridized examples of this vase, but only a very few known carnival examples, all marigold. One example was in the Fenton museum and was named Fenton's Drapery by Mr. Fenton. While this vase also has eight loops, and a base diameter (3.25 inches) close to Boggy Bayou's, it's a much heavier vase, with a very different silhouette.